Prefects and Scouts: can you help identify them? 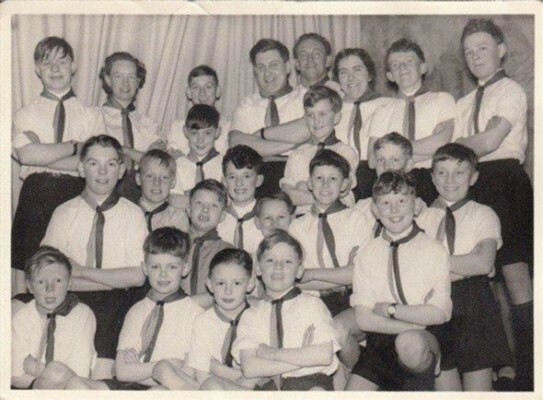 Bottesford Scouts in the village hall, 1957-59. Can any one add names to this old photo from 1960/1? I hope I have got the year correct! Middle front, Jill Hutchinson; fourth front, Philip Taylor. This second picture was taken of the Scouts event in the old Bottesford VC HAll in 1957-1959. Can anyone identify them? This page was added on 20/05/2007. I am in touch with Mike Turrell today as he lives in Luton and also Mike Hadlow who lives at Harpenden. I was at this school from 1959 to 1964. I recall Jill Hutchinson and some of the other faces but the names elude me. Perhaps John could ask Michael Turrell if he could shed further light on to the subject in question? 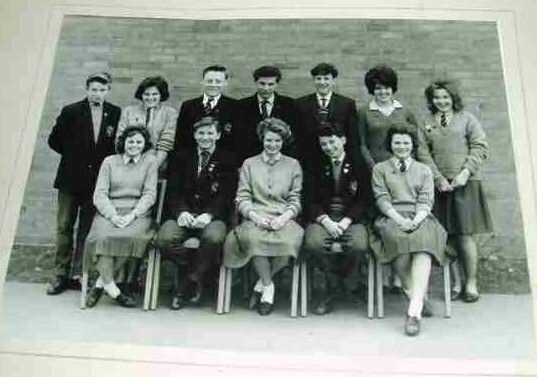 I think the lad seated on the left is Andrew Poole who was head boy. I believe he has now passed away. Top left. Robert Taylor. Middle left. Anthony Whatton. Middle centre. Philip Taylor. Left of myself is Graham Scrubbs. Centre right is Neil Tinkley. Partially hidden is John Topps. Left hand side front row in the scouts photo is I think Peter Donger who lived in Easthorpe. I went to school with him in Muston.